It looks like 2017 is another great year for gin lovers. With a wide range of fantastic gin events and festivals on, you are spoilt for choice. The gin connoisseurs at Copper Rivet have pulled out what they think to be the best gin events of the summer, so get your diaries out and be sure to give them a try. Junipalooza is one of the biggest gin festivals in the UK. This year will be the festival’s fourth year, and many consider it to be the best way to spend World Gin Day. Junipalooza is essentially a celebration of gin – providing guests with the opportunity to sample fine quality gins from distilleries based all around the world. The festival will host 55 gin makers and 155 different gins, from 12 different countries. You can truly explore the world of gin at this unique and memorable event. The amazing Tobacco Docks venue is an added bonus, too. For more information about the Junipalooza event, click here. Are you a fan of chilli, chocolate and gin? Then you will love Frosts’ annual food festival. Boasting an excellent selection of the most unique chilli products, the best chocolatiers, and the finest gin producers in the UK, the Frosts day festival is a superb day out for foodies. While sampling local produce from a huge variety of UK producers, you can whet the palate with a selection of best gins. And help tame the heat. Whether you’re a lover of gin, chocolate or chilli, you’re guaranteed to pick up a few gems here. For more information about Frosts’ Chilli, Chocolate & Gin Festival, please click here. The Juniper Festival is another fan favourite among gin lovers. The Edinburgh-based festival offers an excellent line up of gin and tonic makers, expert talks, and unique tasting experiences for everyone to enjoy. You’ll be able to try before you buy on a wide selection of gins, food products, handmade fashions and crafts. The Juniper Festival really is a celebration of all things gin, showcasing a wonderful array of styles and tastes, including of course, traditional Scottish gin. Guests can also explore the various food stalls and dabble in some of the finest street food around. Cocktail enthusiasts will be in their element too, with a fantastic choice of mixed drinks available. For more information about the Juniper Festival, please click here. The Gin Festival is the UK’s biggest and oldest gin festival, and probably the most popular event in gin lovers’ calendars. 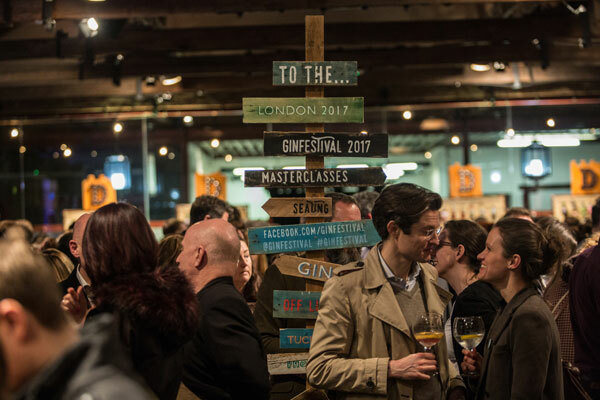 This year’s festival will be hosted in 18 different cities throughout the UK, giving gin-thusiasts all over the country the opportunity to experience some of the best and most exclusive gin products on the market. London’s edition will, like Junipalooza, use the historic Tobacco Dock as its venue. With more than 100 different grains to try, this event is a gin lover’s paradise. There will also be gin masterclasses (with the opportunity to meet professional gin distillers), a gin cocktail bar, live music, and plenty of food to line your stomach with. If you fancy carrying on the party, why not check out the incredibly popular London Gin Club, or take a stroll down to the classy 214 Bermondsey, where you can sample some the best gin and cocktails London has to offer. For more information about the London Gin Festival, please click here. So there you have it. If you don't have time to get to a gin festival this year, there are plenty of gin distilleries that offer tours these days. If you’re ever in the Kent or London area, take a gin tour at Copper Rivet, a brand new craft gin distillery in Kent.